Zucchini is one of the easiest crops to grow (and the instructions here apply to other summer squash as well). In fact, growing zucchini is so easy that you may have the opposite problem: how to not grow it! It is usually so prolific, that with healthy soil and even minimal care, you can harvest so many zucchinis from one plant that you’ll searching for new recipes for what to do with it all, as well as sharing it with all your neighbors. It is the hugest zucchini plant I have ever seen. By the end of the season, the plant (a bush variety) was 11 feet across! It has grown over the paths on either side and into both adjacent beds. I check for new zukes daily, and harvest two or three every single day off that one plant. The most common mistake that many beginners make when growing zucchini is letting them grow too big. This is either because they think that bigger is better, or because they just miss one by not searching closely enough down in the tangled stalks under the leaves, to catch every zucchini the plant is making. If you miss one, the zuke that goes ignored gets really huge ( two feet long and 8” in diameter). This is a mistake for two reasons. First, the plant’s goal is to make seeds, so once one giant zuke starts ripening the plant will put all its energy into ripening the big one, making as many seeds inside it as it can. The plant loses interest in producing many more zucchinis. And second, after a zucchini gets bigger than about 6” long, it loses flavor and get tougher. Those of you who grow flowers will know that the more you “deadhead”, or remove spent flowers off of marigolds or petunias, the more flowers they produce. Growing zucchini is just the same: the more zukes you harvest, the more the plant will produce. So don’t be shy about harvesting zucchinis when they are quite small. They will taste amazing, and the plant will just keep cranking them out. Also, the blossoms themselves are very delicious, either battered and deep fried, or just stir fried. Growing zucchini plants takes a fair amount of water. Since zucchini is very susceptible to powdery mildew, it is best to water your plants at soil level if you can rather than by an overhead sprinkler, especially in hot weather. Powdery mildew looks like gray fuzz on the leaves, and it stresses the plant, decreasing the amount of zucchinis you will harvest. There are many different varieties of zucchini to choose from. Originally, most zucchinis were vining plants, that sprawled all over the place like winter squash and took a lot of garden space. As more and more people started backyard vegetable gardening in smaller yards, the plant breeders developed "bush" varieties that may get large, but they don't sprawl. There are golden colored ones, round ones, and ones with mottled leaves. There are huge ones, and some not so big that are good for container gardening in a large container, such as a whiskey barrel. Check the seed catalogs for pictures, and have fun! 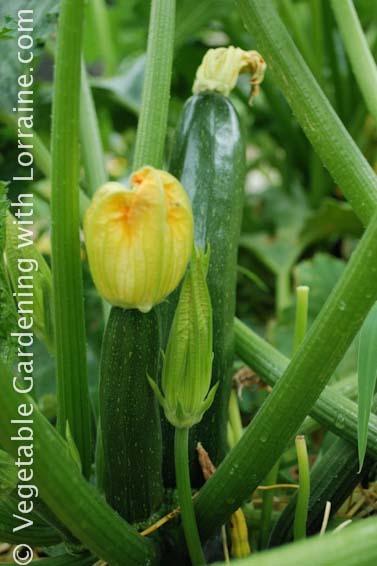 Growing zucchini is fun, easy and in less than 60 days planting from seed, delicious! For your convenience I have included a contact page to my favorite seed catalogs, which is a quick way for you to browse zucchini varieties. So have fun with your zucchini garden, and remember to harvest the little guys before they become big enough to put wheels on and drive!